While you’ve likely planted or cooked with basil, rosemary and parsley, you may not realize what an important ally herbs can be in healthy living—and just how many there are out there. Herbs can bolster our immune systems and help us deal with life’s daily trials, but did you know that these natural superheroes can also reduce menopause symptoms in women and help thwart cardiovascular issues in men? 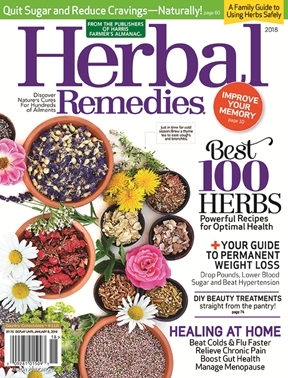 In this issue of Herbal Remedies, learn how to soothe a sore throat, shorten a cold’s life span or concoct a calming tea for the kids. In the kitchen, make your own herbal oils and butters to use in our delicious gluten-free recipes. And end the day with a soothing herbal bath of essential oils blended as you like it. Whatever your lifestyle, Herbal Remedies can help you live it well, naturally.